The Episode starts with Abhi and Pragya check for Tanu, but couldn’t see her. Purab says she will not get place even in hell. Purab telling Abhi that they shall send Tanu to jail. Abhi says we will send her. Abhi says we shall inform Pragya. Aaliya comes. Dadi tells that Pragya saw Tanu. Aaliya asks where is she? She tells that she will see her. Purab says she is not here. Aaliya says I know if Pragya saw her then she is around, she is a mad woman. Abhi says it is just your illusion. Aaliya says I will go and check, it can’t be illusion. Tanu comes to Nikhil and says I need your help. He asks her to go. Tanu says I am Tanu. Nikhil says I am tired of you and says you must have come here as something good might be happening with Pragya. He asks her to leave and says he is ruined because of her. Tanu asks will you help me or not. Nikhil says you are selfish. He says you just want to tell your thing and don’t want to hear me. Tanu says I don’t want to hear you. He says you are inauspicious and says he got someone’s call and he asked for money. He says he is ruined because of her and says Abhi is ruining me unintentionally. Tanu provokes him against Abhi and says you deserves revenge. She says if you take revenge from Abhi and hurt Pragya then I will give you 1 crore Rs. Nikhil says I know you have no money. Tanu says I stayed with Abhi for 7 years and have accumulated much money. She asks him to hurt Pragya’s twins so that everyone forget smiling at Mehra house. Abhi asks Dasi why they want to oil her hands. Dasi and Dadi tell that it is a rasam. Abhi says she will not look nice in oily hairs. Pragya blackmails him emotionally and says you don’t love me now. Taya ji says you are gone? Nikhil comes there and joins as dhol guy. Abhi says you are so good. Pragya laughs and says she is joking. Tanu is sitting in nikhil’s house and waiting for him. She thinks how much time, he will take and then my time will come. She says I want to hurt Pragya, but now want to make Abhi cry. She acts crazy and says Abhi shall know that I will not let him be happy with Pragya. She drinks and says now he must understand that I am in his life only and nobody else. She says Pragya…you have to go and then Abhi will see me then and he has to accept me. She thinks to get ready to meet him. She then thinks she shall look dull and everyone shall sympathize with her. She waits for Nikhil’s call. She says your barsi will be celebrated there. Kiara comes and collides with Nikhil, and says sorry. She goes to Abhi and says she wants to dance. Abhi says we will dance altogether. Dasi says she shall not dance in this condition. Abhi says we will dance slowly. They dance slowly. Abhi takes Kiara and dances. Kiara kisses them. Kiara runs to her room while her parents are dancing. Nikhil goes behind her. Tanu asks if the work is done. Nikhil says timing is needed for such things and says work will be done. Tanu says festival mood might be happening. Nikhil says if killing pragya is easy then you should have done and says Abhi is dancing with Pragya and is stuck with her. He says I am wondering seeing how their love blossoming. Tanu says I loved Abhi very much and that’s why didn’t accept your love. Nikhil says I never loved you, it is good you didn’t love me. I just need Abhi’s money. He thinks to hide the gun somehow. Tanu thinks she will get Abhi for forever as Abhi loves Kiara very much. She thinks to love Kiara and make her supermodel like her. She says Kiara…my daughter…I love you and will see you soon. Kiara searches for Pragya’s phone and thinks she wants their photos. She clicks her pic and thinks she is pretty like her mum. Aaliya asks where is she going? Kiara says downstairs. She clicks selfie with her. Nikhil sees Kiara. Kiara recalls seeing him and asks if he is the same man who did John’s murder and her accident. She says she will tell everyone. Abhi is with Pragya and makes her have sweets. Tayi ji hears the sound and asks Mitali to check the kids. Kiara runs away from Nikhil and hides behind the pillar. Nikhil comes near the pillar and goes. Kiara sees Mitali at the other side of balcony and calls her. Nikhil comes to Kiara and says I know you are here. He says you can’t be saved now. He says if I catch you then it will be bad. Abhi asks Sunny about Kiara. Sunny says he doesn’t know. Mitali says she was shouting while you were playing with her. Sunny says no. Pragya tells that Kiara is not well. Nikhil takes unconscious Kiara to room. 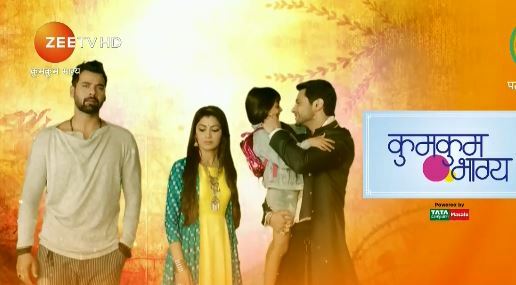 The post Kumkum Bhagya 26th February 2019 Written Episode Update: Nikhil reaches Mehra house and will kidnap Kiara appeared first on Telly Updates.